We offer gifts for all occasions including Virginia Souvenirs, Virginia Made products, Tervis Tumblers, Candles, Home Accessories and Decorations, Jewelry (including Kameleon Jewelry), Clothes, Baby Gifts, Wedding Gifts, Picture Frames, Flags, Linens and much more. We also offer a large selection of scarves, pocketbooks and many other accessories for any season. If you are looking for the finest gourmet foods available, not only will you find our delicious, super, extra-large Virginia Peanuts - prepared and packaged in ways you've never imagined, but we also carry Virginia wines, country hams, barbecue sauces, maple syrup, apple cider, dips, seafood seasonings, cakes, cookies, jams and jellies just to name a few. Tasting samples of our peanuts and other gourmet foods are available daily. Bus tours are welcome! Bathrooms are handicap accessible (and clean). The Peanut Patch Gift Shop is a great place to stop and rest, as well as to shop. Take I-264 or I-64 west to Rt.58 towards Suffolk. Follow Rt.58 past Suffolk and Franklin. 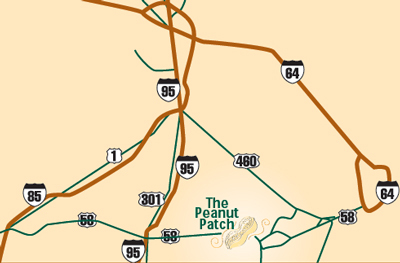 The Peanut Patch is located on Rt.58 Bypass about 7 miles past last Franklin (Armory Drive) exit. You'll see the store on your left beside the Dairy Queen, but you'll actually have to pass it and turn around in the median (Rt.58 is a divided hwy). So, you'll make a right hand turn into The Peanut Patch. Take I-95 south past Petersburg. Take exit 41 (Rt.35) and bear right off the exit. Travel on Rt. 35 approximately 35 miles through downtown Courtland to the intersection with Rt.58. Take a left on Rt.58. We're just around the curve on the right (driveway before Dairy Queen).